(A. Gray) Rydberg in N. L. Britton et al. Found in FNA Volume 21. Treatment on page 393. Leaf lobes (3–)7–25(–75+), ovate to oblong or lanceolate to lance-linear, 4–12(–25+) × (1–)2–6(–12+) mm. Involucres 5–7+ × 10–18+ mm. Ray laminae 5–10+ mm. Disc corollas 2.5–3(–4+) mm, ± stipitate-glandular. Cypselae 2.5–4+ mm. 2n (= 3x) = 36. Ariz., Calif., Colo., Nev., N.Mex., Tex., Utah, Wyo., Mexico (Baja California, Chihuahua, Coahuila, Sonora). W. L. Ellison (1964) reported “n = 18, metaphase II,” based on observation of meiosis in a microsporocyte. D. J. Keil et al. (1988) noted that anthers are often abortive and meiosis is irregular and that seed set is usually high in A. dissecta. Keil et al. suggested that A. dissecta is an apomictic triploid derived from a cross between a diploid plant with n = x = 12 and a tetraploid plant (or unreduced gamete) with n = 2x = 24 so that for A. dissecta 2n = 3x = 36. 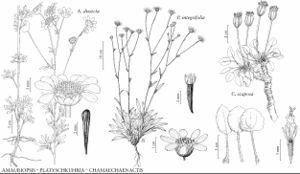 Some plants (from Arizona, Baja California, and New Mexico) with poorly developed ray corollas and ± hairy cypselae bearing pappi of 1–13 lance-linear to lance-subulate scales have been identified as belonging to Amauriopsis dissecta. Such plants may be hybrids resulting from crosses between A. dissecta and some other pappose species.